I found it difficult to complete my TalesoftheCork assignments during August. In the weeks leading up to dropping off my youngest daughter at Arizona State University, family memories flood my thoughts. And so, before I continue, I offer this and occasional personal tales to my readership. My hope is to release them before I cling too tightly to their memory, stifling my desire to move forward. 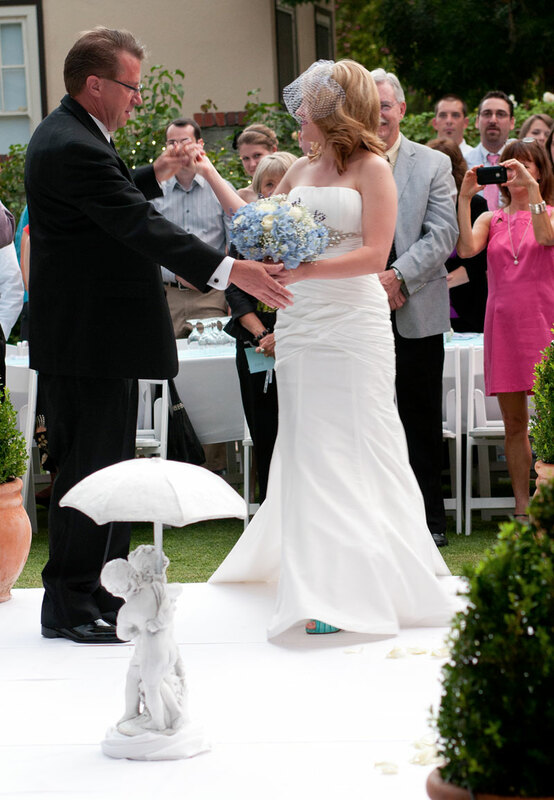 The first installment is to celebrate my daughter Brianna’s first wedding anniversary. I walked my firstborn down the aisle last week. After learning how to hold my first-born, albeit awkwardly, after the first few days, the next 23 years seemed a blur and Brianna’s wedding is now already behind me. Her words initially stunned me. The wonder of creation had just exhilarated and captivated me a few minutes earlier. But I recovered, shook my head from side to side and blurted out, “Amazing!” I remember smiling so much my cheeks hurt. Yet after a moment watching my baby’s dark eyes and tiny hands waft back and forth, my mind drifted to a future event. Today, I reflect back on a whirlwind three-day weekend: A blur of decorating a friend’s backyard, the rehearsal and dinner, the ceremony and party afterwards and, finally, eight hours of clean-up. After a traditional church wedding 25 years earlier, Geena was determined to create a cottage atmosphere for our oldest daughter’s ceremony. With a “Go for it, mom,” from Brianna, Geena transformed a beautifully restored 1920s Tower District manor into a French country garden estate for Brianna’s wedding. Casual. Relaxed. Intimate. Utilizing an army of friends’ help, the ‘venue’ beheld floral accents, benches topped with pillows, a fountain and pond, candles, designer lighting, music and more gourmet food and drink than guests could consume. My part? I joined the groom and a buddy and did what we were told–lighting. Yup. That’s it mostly. Sure we helped set up, buy more stuff and move things, take down and clean up. But this was really a day for my wife and daughter. Just like 23 years ago, Geena knew what to expect with the first kid: Long hours and attention to details, a commitment to selflessness, tired feet, and a whole lot preparation and sacrifice that I hadn’t a clue one of. So this time, I followed Geena’s and the bride’s instructions precisely, right down to a garden path that lead to an alter. Well, not exactly an alter: A spot under three 18-foot purple-flowering crepe myrtle trees in front of a pond to be exact, just before sunset. When Brianna curled her arm under mine, she smiled and whispered, “It’s time Daddy.” My heart seemed to leap into my throat. A tear suddenly rolled out of my already misty eyes. I pulled her close and starred at a radiant angelic expression that can only be created on such a day. At that instant, moments of previous disappointments, hardships, hurts, cost overruns, misunderstandings, failures (mostly on my part) and sorrows all dissolved. 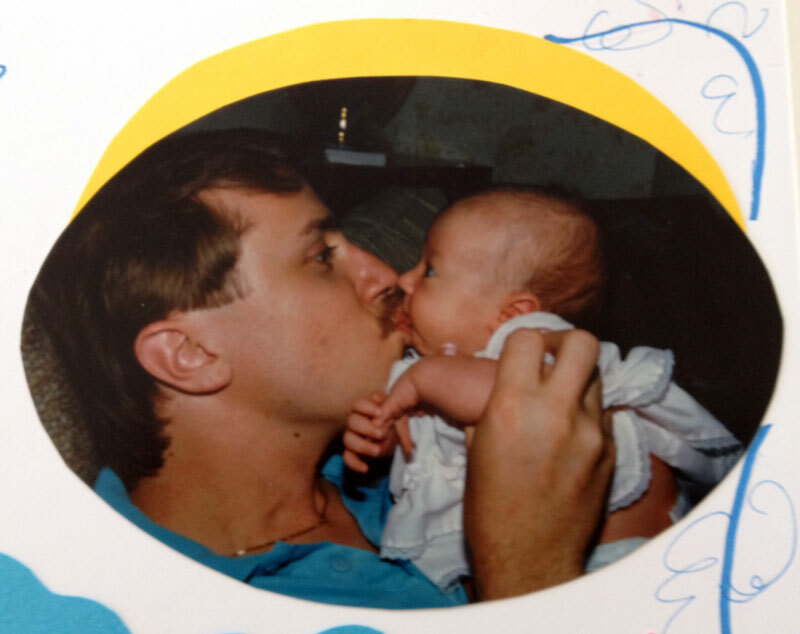 My thoughts drifted to the first weeks after bringing Brianna home. I stroked her tiny soft blond curls as she slept. The cooing melted me as she nestled in my arms. Our walk along a flower-strewn path was too short. I just had time to call her my princess, twirl her like Cinderella as we crossed the bridge over the pond, adjust her train, pause to take in the scene and smile to Geena before we stopped to face the waiting groom. Then suddenly, Brianna squeezed my arm to her side, pulled me forward and squealed, “This is it! I’m ready!” Tiffany blue satin heels shifted side to side. The gleam in her eyes, her luminous smile overwhelmed me. Jubilance. … That is the only way to describe our next few steps together. Or maybe the feeling was euphoric or a seventh heaven experience. All I know is that we stepped out beyond the double French doors and into the garden arm in arm. 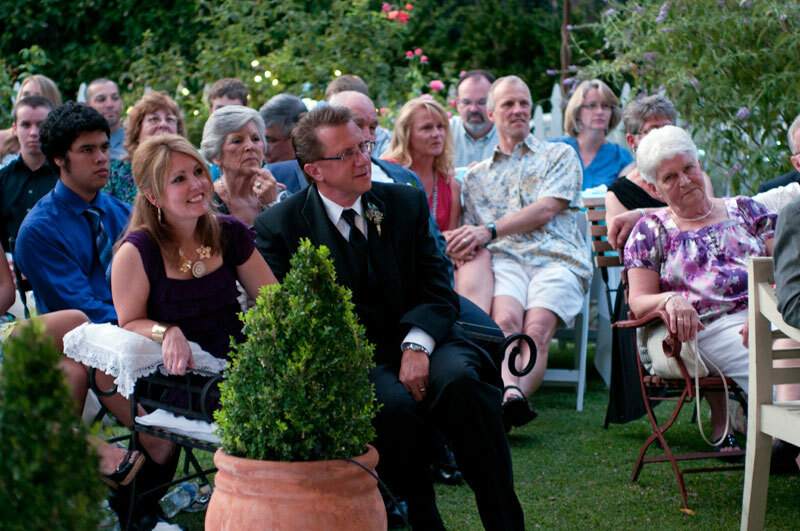 Over a hundred and sixty seated friends and relatives welcomed our entrance smiles aglow. I straightened up, breathed deep. Brianna’s grasp tightened; she giggled as the first guests gasped, catching a glimpse of her. I felt on top of the world. She was dazzling. My daughter seemed to float across the grass in her strapless white silk dress. I fiddled with my white cuffs and tugged down on the edge of my black tux coat. This was to be a rapturous moment. But our walk along a flower-strewn path was too short. I just had time to call her my princess, twirl her like Cinderella as we crossed the bridge over the pond, adjust her train, pause to take in the scene and smile to Geena before we stopped to face the waiting groom. The next few minutes were special, most personal. The pastor explained to the guests Brianna wore a purity ring, which symbolized an intimate covenant she made to her dad. Our hours spent in conversation and almost a decade living out a life in honor and respect for self and family became her testimony. She promised she would save her heart and body for the man she would marry. And while she admitted keeping a pledge was not easy, she was now ready to make a lifetime vow. Before I could give her away, Brianna turned to me and placed the golden rose “Promise Ring” she had worn since her 14th birthday in my hand. She smiled and told me she no longer needed it. We both stood tall, confident in our relationship, past and present. But before I could shake Stan’s hand, give her away, and say “her mother and I,” my daughter motioned me to lean close. “Daddy, I have something to give you.” And as I turned to face Brianna, she delicately removed a tiny rose-embossed gold promise ring she had worn since her fourteenth birthday. “You can have this back now.” She took my hand and placed the ring in it. Her hazel eyes sparkled, glistened, and danced; I didn’t want the moment to end. And before I knew it, she cupped my fingers over the little ring. I could barely breathe. I tried to smile in spite of a gush of emotion. I hugged, squeezing her close and tried to whisper, “thanks” but nothing came out, only tears. With that I walked behind her to my waiting wife. Geena and I intertwined our hands, smiled at Brianna’s sisters standing next to her, and stood together ready to watch our daughter marry the man of her dreams. 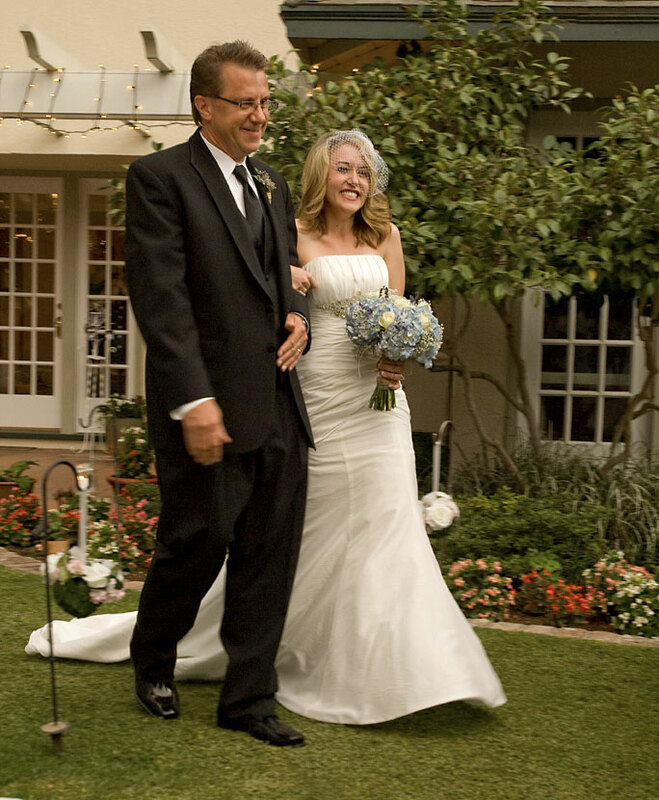 After hugging Brianna one last time and shaking Stan’s hand, I joined Geena, my wife, on a park bench and watched my daughter marry the man of her dreams. 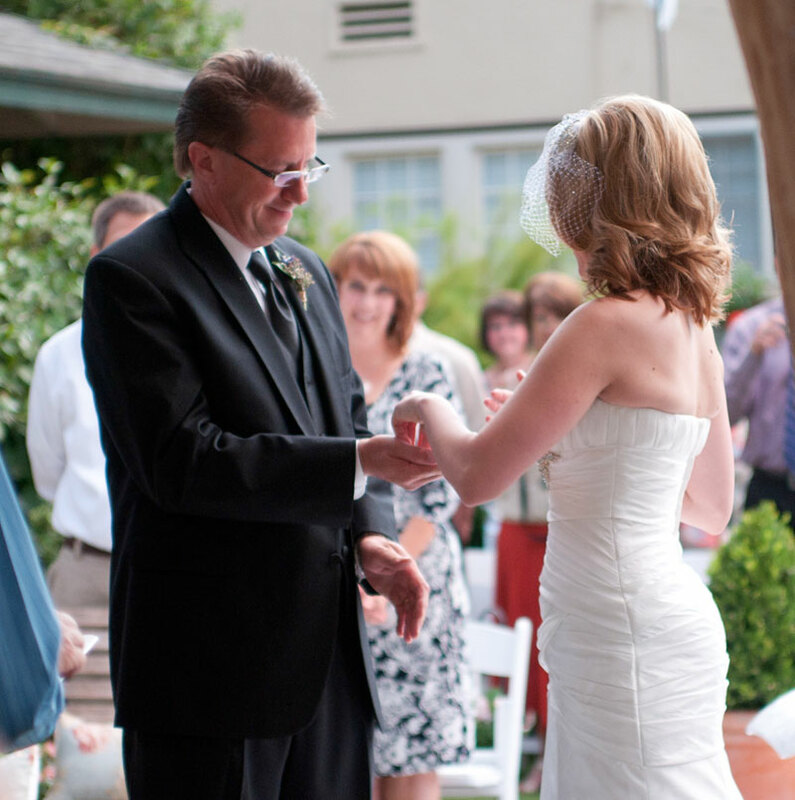 All wedding photos by Mullins Wedding & Portrait Photography in Fresno, CA. For a previous TalesoftheCork story, check out A time for change: Mike Sinor winemaker of the year, Part II. UPDATE: I also ask your patience as I am still working on Part II of Rangeland Wines and Angus beef: Get to know Laird Foshay. Wonderful moment, beautifully described. Congratulations! What a beautiful heartfelt personal story of life ~ highlighting this glimpse of one special moment in time. Thank you so much for sharing. Oh my. As I rarely cry, these moist eyes are testimony of your skilled pen describing this most precious event! !